Philadelphia Water and the Green City, Clean Waters program received the first-ever Climate Hero Award at Sustain PHL, a citywide sustainability celebration held before a packed house at the WHYY studios on August 18. Top Left: Solar panels at our Southeast Water Pollution Control Plant; Bottom Left: Part of our Sewage Geothermal Installation, located at the Southeast Water Pollution Control Plant; Right: Trees and plants at hundreds of sites citywide represent a green infrastructure network well-suited for coming climate change impacts. Philadelphia Water was recently nominated as a “Climate Hero” for the first-ever SustainPHL, a citywide sustainability celebration hosted by the great people behind Green Philly Blog. The event will take place on August 18 at the WHYY studios on 6th Street, across from Independence Hall. So what puts us in this category along with Swarthmore College and #ClimateDisrupted? How can a water department like Philadelphia Water be a “Climate Hero”? A better question might be: how could we not get involved in climate change? At the start of the month, we talked about the Paris climate change conference and what we're doing to prepare for global warming. Record high temperatures were set over the weekend and more highs are likely this week. 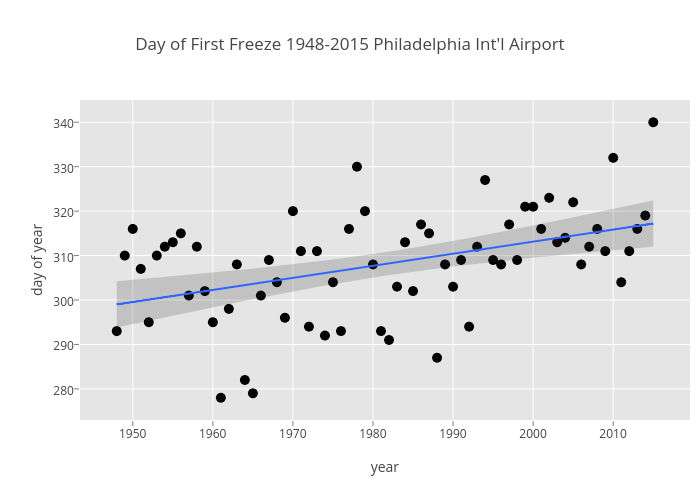 But it’s another warm weather-related event that has us concerned: Last Sunday, December 6, was the first time in fall 2015 that the official temperature at Philadelphia International Airport was at or below 32º F.
This is about a month later than the average date of the first freeze, and it's the first time we've gone without a freeze through November. In fact, when looking at the period of record from 1948-2015, it's the latest the first freeze of the year has happened, beating the previous record of November 28, set in 2010, by eight days. And while weather is not climate, the date of the first freeze has been getting later over the last few decades. Chances are, you’ve already heard a little bit about the Paris climate change talks—formally, the “21st Conference of the Parties” or COP21—that kicked off yesterday with world leaders calling for action. While those talks might seem a world away, there are more than a few good reasons for Philadelphians to pay attention.